Carmichael Water District flushes the system primarily in the winter months when water demand is low. The District also flushes lines at a customer’s request. During seasonal demand variations when the District operates wells and during project or emergency shut downs the distribution lines may be affected. At these times, you may notice a discoloration of your water. The district will schedule flushing in affected areas on a regular basis as well as on an as needed basis. What do I do if I get sediment in my house? Flush your household during and/or after this period by opening the front hose bib and letting the water run for several minutes or until it clears. Next open the back hose bib and let the water run until clear. Do not have water on inside while doing this procedure. If you experience brown water in the hot water only, flush out your hot water heater. Most manufacturers recommend flushing the hot water heater at least once a year. If you experience a problem with brown water during a time when Carmichael Water District is not flushing in your area, try the above flushing procedures. If you are still experiencing a problem, call our office at (916) 483-2452 to report it. 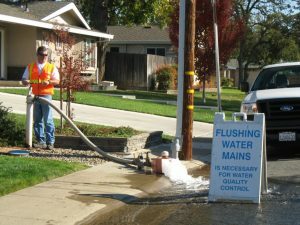 Carmichael Water District will then schedule your area to be flushed.